Live performance featuring banjo and acoustic guitar. Live performance at a wedding in Cambria, 2018. Live performance featuring acoustic guitar and mandolin. Live performance featuring acoustic guitar and banjo. Lawrence & Clare are a talented married couple with years of performance experience and satisfied clients. Their performances are extremely entertaining and diverse! Vocal harmonies accompany piano accordion, acoustic guitar, soulful keys, mandolin, banjo, ukulele & harmonica. They draw influence from folk/ Americana/ pop/ jazz and the classics. Performances feature timeless cover songs as well as catchy original material. They are flexible with budgets, super personable, have their own live sound equipment and are willing to travel. If you want to bring a great sound to your next function or have a wedding band to remember, Lawrence & Clare are the duo for you! Lawrence and Clare made it the party of the year! I hosted Lawrence and Clare at my house for an intimate concert in October, 2017, and again in March of 2018. Despite their youth, Lawrence and Clare were exceedingly comfortable in front of an audience, and established a wonderful rapport with everyone in attendance. They are multi-instrumentalists and have at least 90 minutes of original material. We did a sing-along in October that went over really well, too. Their repertoire ranges from soulful spirituals to upbeat covers and even included a lesson in body percussion from Clare. She has an effervescence that is contagious, along with an extraordinary vocal range. Clare and Lawrence have wonderful chemistry between them, which conveys well to an audience. They were self-contained, highly organized and professional, which enabled them to do a quick set-up with amplification suitable for my living room. Many friends called it the “party of the year,” because of the intimacy and connection established with Lawrence and Clare. I would absolutely give them my highest endorsement. Lawrence and Clare were amazing!! They were very professional and pleasant and we were lucky they happened to be available on short notice. They even took the time to learn the songs I had requested for my first dance and father/daughter dance and played the songs live! It was even better than I had imagined them to sound. :) They played for hours and the songs they chose for their playlist were perfect music choices for a wedding. Couldn't be more pleased with their services. Thanks again you guys! Lawrence and Clare played for our wedding in Idyllwild in the most serene forest setting. We requested them to learn 4 songs and they played them perfectly. They captured the essence of the songs while making them their own. Our favorite was the one they played for our first dance! During the planning stages they were incredibly professional, responsive, and lovely to communicate with. They provided us with an extensive list of songs they knew for us to choose from - all of which we loved. They even wrote us a sweet card wishing us well on our marriage. We can't recommend Lawrence and Clare enough - they have what it takes to play ANY event. 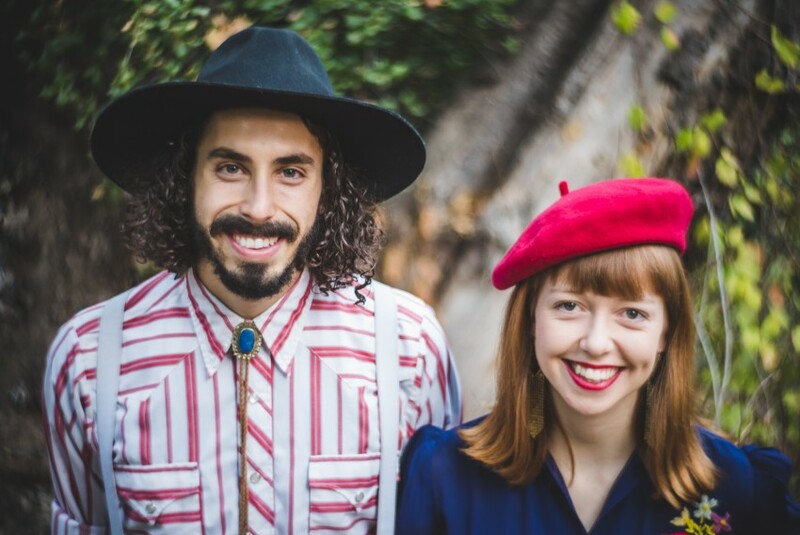 We first saw them play at a restaurant in Idyllwild and immediately knew they were the duo we wanted to play on the most important day of our lives. My husband and I both feel they've gotten even better over the past two years - which we didn't think was possible :) They are just the sweetest!! It was an absolute pleasure to be hired as the wedding band for Blake & Amanda's Idyllwild forest wedding. We were honored to be a part of their special day! What a great couple and memorable wedding. My friends and I have had the good fortune to host Lawrence & Clare for a few house concerts in our various homes, and their performances have been amazing! They have even been gracious enough to humor our request for a group sing-along after the house concert allowing all of us the absolute pleasure of joining them in song and community! They are professional and incredibly skillful in music making and particularly fabulous at putting their audience into a state of wonder. Anyone who has loves music and enjoys a small venue should book these two geniuses before they become super famous and unavailable for such things. They made our special day that much more special! Amazing, professional, dependable... did I mention amazing?! I planned a destination wedding in CA and contacted Clare and Lawrence to play at our ceremony. They were so easy to work with, even from afar. The songs they learned for our special day were perfectly done, and their sound is so unique and beautiful. I could not have hoped for a better couple to play. Literally a dream to work with AND listen to. Erin was such a wonderful bride to work with! She was super friendly, professional and communicative. She explained to us in great detail her vision for her wedding day in advance which really helped us to bring that dream alive. It was an honor to work with her and the Joshua Tree wedding definitely looked like something out of a magazine for a dream wedding! If you like folk/classic rock and are looking for an extremely talented band for your event or venue, look no further than Lawrence and Clare. They play so many familiar and beautiful classic rock and folk covers, as well as a few amazing originals. I first heard Lawrence and Clare play at Pechanga Resort. I had planned on leaving much earlier that night, but once they started playing, I couldn’t leave. In fact, they were so good that I didn’t leave until they were done for the evening and I had a chance to hire them for my (then) upcoming 40th birthday party. When I hired them for my party, I didn’t request a single specific song, I had them run with it. At the party, my friends thought for sure I gave them a play list of all my favorite songs. Just a few of the bands they cover – Dolly Parton, John Denver, Cat Stevens, Beatles, Guns N Roses (! ), Dusty Springfield, and many others! They are uber talented musicians (on multiple instruments), have amazing voices, and are so great to work with. I would hire them again in a heartbeat. Audiences can expect to see us playing many genres of music on many different instruments. We are willing to tailor our sets to the specific style of your event. Lawrence & Clare are a husband and wife Americana folk music duo. Hailing from Louisiana (L) & Australia (C), their worlds collided in Scotland in 2012. For now they hang their traveling hats in the mountain town of Idyllwild; one of Southern California’s best kept secrets. This troubadour duo enjoy extensive touring internationally as well as across America. Their live shows feature effervescent vocal harmonies performed alongside accordion, mandolin, banjo, guitar and keyboard. Known for their diversity and on stage charisma,Lawrence & Clare are an unforgettable act! If hired we will bring all of the equipment necessary to the gig at no extra charge. We will plan accordingly depending on how big or small the gig is but this means speakers, sound board, mics, mic stands, monitors, etc. In addition our sound system can be used for announcements or anything else the party may need free of charge and announcements can also be made by us whenever needed.